Valquest testing is carried out on-site to ensure we have absolute quality control over our thermostatic cartridges. Our in-house Valquest testing laboratory means our well-known anti-scald cartridge can undergo continuous research and development. 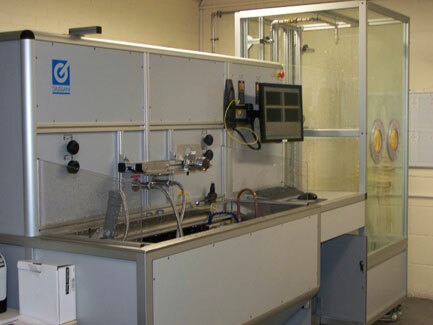 Valquest testing is extremely rigorous to ensure that every single product meets the most demanding standards. All Valquest cartridges are endurance and performance tested to the highest standards so that installers can be confident in the quality of each one. We guarantee that all appropriate standards and approvals are achieved. All Valquest cartridge assembly and testing is carried out right here in the UK by our in-house specialists. Our dedicated and highly-skilled technicians carry out continuous Valquest testing so that our thermostatic cartridges are constantly evolving. Our research and development has led to the unveiling of multiple models of the Valquest cartridge - in order to suit virtually every shower and every application. We have invested heavily in our research and development facilities and this has resulted in the Valquest thermostatic cartridge being the most specified in the industry. Its patented design, impressive flow rates, precise accuracy and automatic shut-off are just some of the features that have made it so successful in domestic and commercial installations throughout the UK. To find out more about thermostatic cartridge assembly, Valquest testing, or our in-house research and development facilities. Please get in touch using the contact us page.